This oil painting is a special kind of illustration common in Victorian times, showing a sympathetic view of how people in other nations lived. This painting was lent to Bethnal Green Museum to accompany a Japanese Room display in 1884, which contained objects belonging to the artist. In this painting, a splendid interior and its contents are shown in meticulous detail. 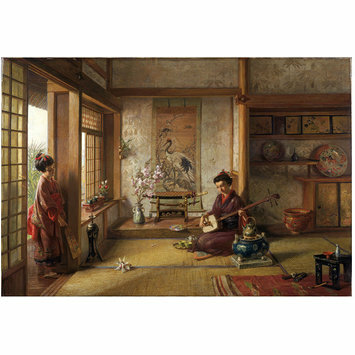 Human interest is catered for by showing the cultured mother playing a samisen (a three-stringed Japanese guitar). The child is asking silently but politely if the feathery shuttlecock could be retrieved from the tatami mat just inside the door. 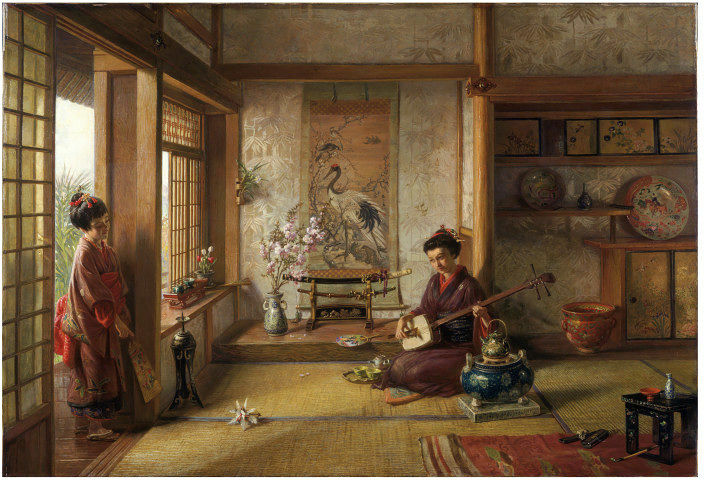 The painting presents a very picturesque British image of the East, as objects would not be displayed together like this in a real Japanese room. Frank Dillon was a painter in oils and watercolours, predominantly of landscape subjects, but also of domestic Islamic architecture. He was actively concerned with efforts to preserve the Islamic monuments of Cairo. In his desire to preserve domestic Egyptian architecture, particularly the interiors, he had painted accurate pictures of them as a kind of benign propaganda exercise. He peopled them with their inhabitants in appropriate costume, to give scale and to make them more appealing. He treated his later pictures of Japanese interiors, such as this scene, in the same way. 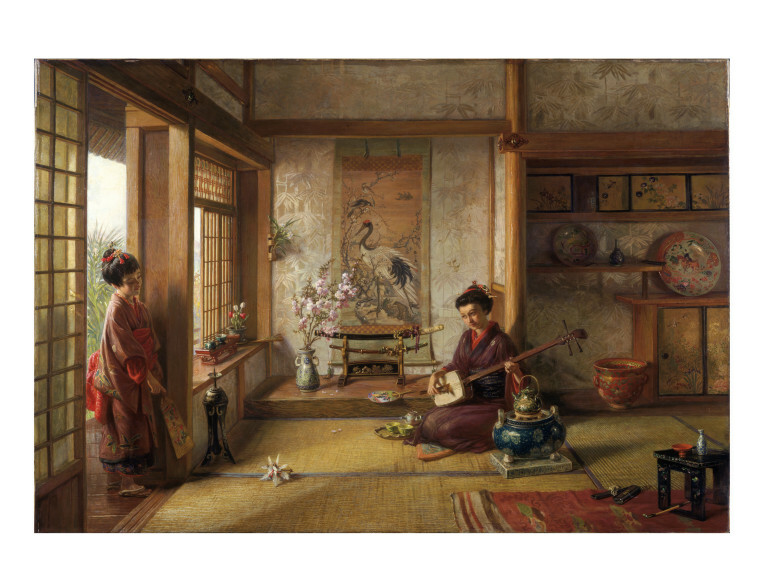 Oil painting of two women in a Japanese interior. At right woman kneels, playing a musical instrument - a woman at left against a window. A shuttlecock on the floor between them. Oil painting entitled 'The Stray Stuttlecock' by Frank Dillon. Great Britain, 1878.